This article on the e-Democracy.org project blog shows how GIS maps are being used in planning strategies that engage greater diversity of participants in the on-line community. Follow the links in the blog to more articles. I hosted another Tutor/Mentor Leadership and Networking Conference on June 14, 2012 at First Unitarian Church in Chicago. 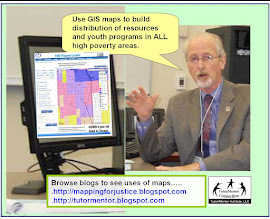 I've been hosting these every six months since May 1994 and in every one I've shared maps like these to illustrate the vision of the Tutor/Mentor Connection for mentor-rich non-school programs to reach kids in all high poverty neighborhoods. For this vision to be achieved leaders in business, politics, religion, health, law, sports and entertainment each need to be using maps to support volunteer and donor mobilization strategies that reach programs in all parts of the region. I've not been able to make new maps for more than a year since our money ran out and we no longer have a map-maker on staff. If you'd like to join with us as a partner, sponsor or volunteer we can continue to provide the maps that others can use to support their own decision making. 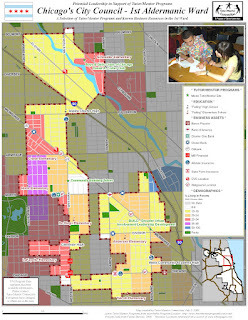 Visit this link to find maps showing the current Cook County Government boundaries and the proposed new boundaries. With more and more people learning to use maps our hope is that they will use them to mobilize volunteer talent and dollars to support the growth of mentor-rich youth programs in areas with highest concentrations of poverty, violence and poorly performing schools. Elected officials can provide the leadership to bring people together and focus attention on this issue and they can be held accountable by voters for what they do or do not do. Businesses, hospitals, faith groups in a geographic area can also provide leadership and be held accountable. 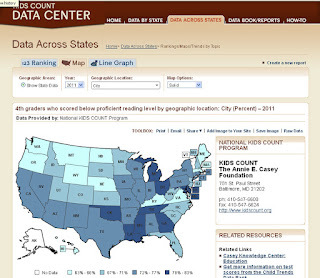 Visit more of the articles on this blog to see how maps can be used. This project is in a dormant stage now since funding is no longer available to create these maps and write these stories. However the examples illustrate what is possible. Great Schools offers this widget for making maps showing private schools in a city. I've mapped Chicago. If you're someone writing about public education I'd like to connect so we expand the conversation to include private schools as well as public. Maps like this can help. This map does not include poverty overlays, or show which schools are under performing, but I'm sure others may be developing map-tools to do this. The Interactive Map that the Tutor/Mentor Institute, LLC hosts includes these features and points to the location of non-school tutoring and/or mentoring programs. 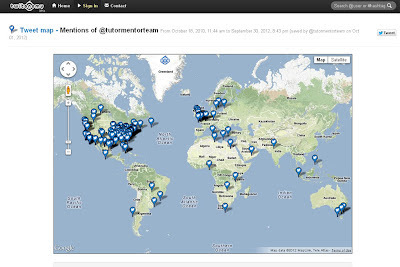 However, our map has not been updated in three years and without the resources to do this we can't expand it's impact. This is an image from the interactive map of Chicago City Council Wards. Find it on the WBEZ91.5 web site. The map does not show Ward numbers so you need to click on each area to see what Ward it is. 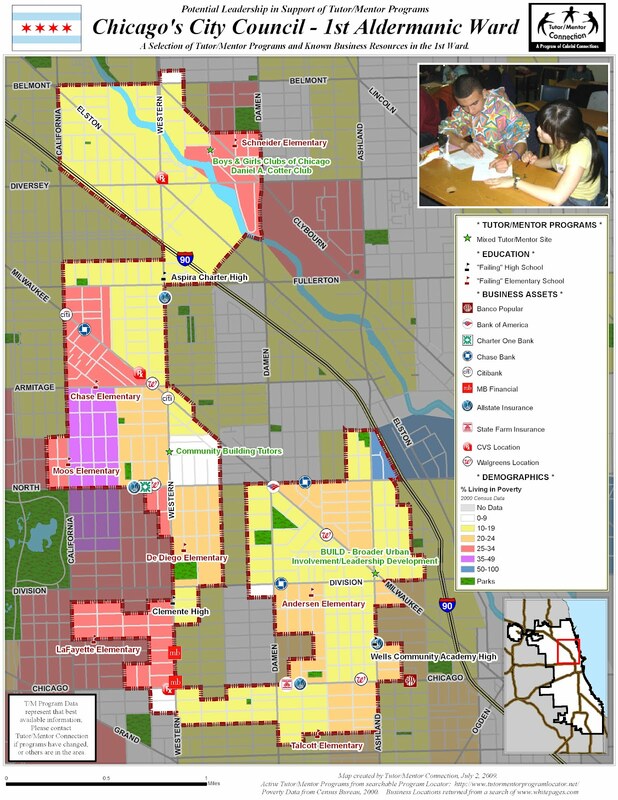 With help from donors/partners or sponsors we can put this map on the Tutor/Mentor Program Locator and overlay information about tutor/mentor programs in each Ward. Right now we do not have resources to do this or to update the other content on the Program Locator. 2016 update. 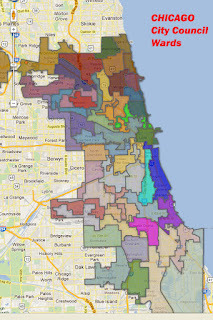 Here's the Chicago City Council web site, with a map of Chicago Wards. Visit this page to see a map showing where Internet capacity is greater and less throughout the United States. This is another demonstration of how maps can be used to create broader understanding of an issue as well as strategies to bring resources to under served areas. I attended a Community Development Conference in Chicago and this opened up a wide range of new resources that I was not aware of and that might be useful to those working for the well-being of young people and families. Use maps to change the political will! 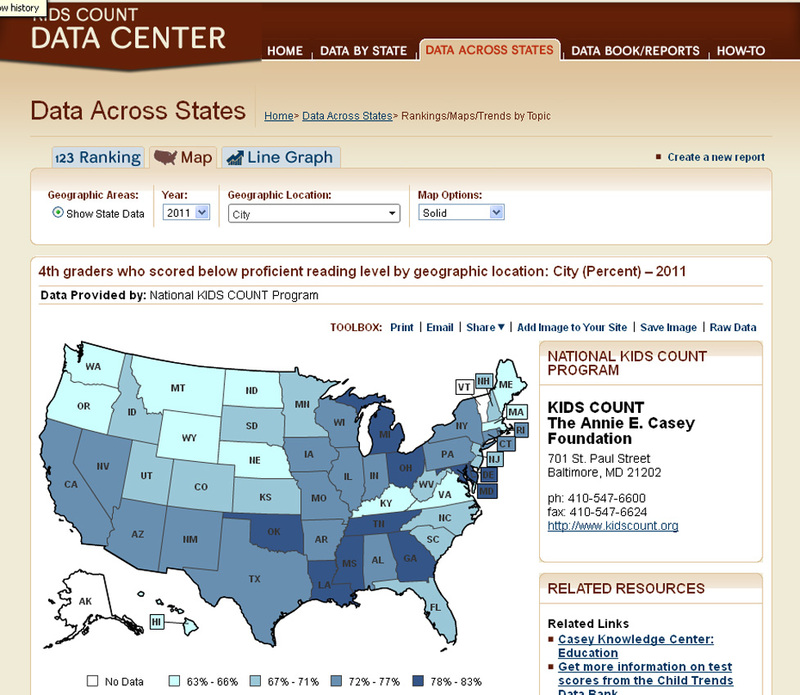 I encourage you to take a look at the Kids Count Data Center, which is provided as a service of the Anne E. Casey Foundation. You can make your own maps using the data on the site, or if you are a GIS expert, you can download the data and use your own GIS. I don't have a lot of time to dig through this DataCenter to know what types of maps can be produced, but I hope it has the capacity to go beyond state level to view the data at the city or county level. There is such a difference between poverty in big cities like Chicago and the rest of the state of Illinois that a statewide report does not really show how bad things are in the big cities. Furthermore, I would like to see an example of how the maps can be used to build public involvement in actions that reduce poverty based on information shared by many organizations via the Internet. I posted this article to show how maps could be used to mobilize enough votes to pass legislation regarding high school drop out issues. 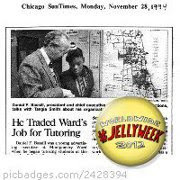 I posted this article to show how people can make their own map stories using the Tutor/Mentor Program Locator. And, I posted this article to show how people can communicate these ideas to their own networks and take responsibility for "expanding the choir" of people involved, and who ultimately vote for public policies favorable to helping the poor and the organizations helping the poor. I'd be happy to spend a couple hours with your organization or company to help you understand and apply these ideas. I'd love to help your school create a Tutor/Mentor Institute Club, where students learn to apply these ideas so they can have a greater impact on what adults to to support their own learning opportunities. I encourage you to take a look at this site which includes a growing map of people involved in social change throughout the world. This is a project of Edgeryders and Citizens in the Lab, who "want to collect examples and showcase the cultural innovation which is shaping a new way of making our way in the world. We are interested in new kinds of employment, social enterprises and other projects which embody new values, cultural centres, galleries, projects and teams. If it's a place that people can visit, so much the better - take a tour in your own city or while you are traveling, and see some of the New Planet." The map below is created by the US Chamber of Commerce and is a great tool to show business involvement, by company and by category, all over the world. If this map does not open, visit this page to see the actual map. If we can connect with the people leading this effort perhaps we can combine the map-making purposes of the Tutor/Mentor Institute, LLC so that over time a map of business involvement in tutor/mentor programs in all parts of the world would show involved from more and more business groups in a larger number of places. Furthermore, if we can connect with their marketing groups then at key times of each year company communications, PR and social media would be encouraging people to volunteer, donate, or join learning circles where they could do more to help every tutor/mentor program constantly improve their impact on youth and the volunteers who are involved. 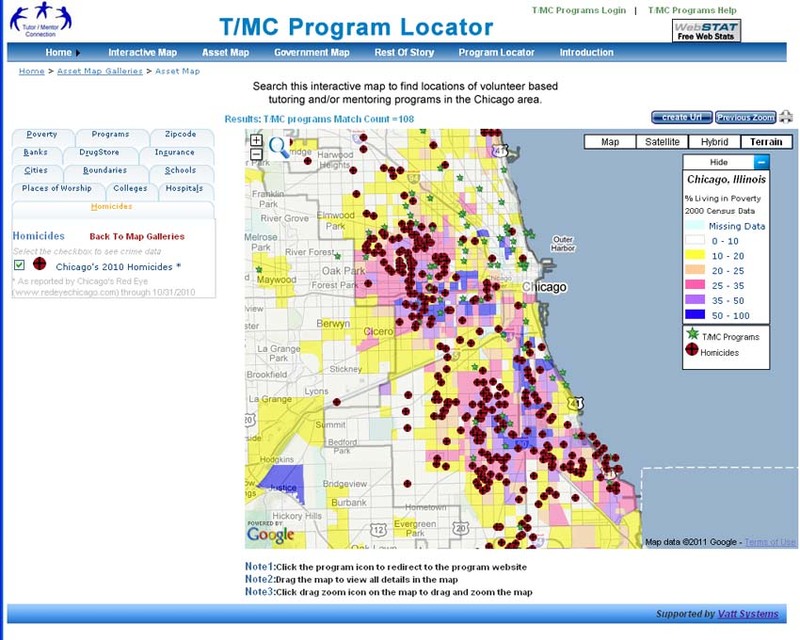 One type of maps that we've been piloting shows the geographic areas of the Chicago region where well-organized tutor/mentor programs are most needed. Leaders can use maps like this to organize actions that support existing programs with volunteers, dollars, technology and ideas, while helping new programs start where too few exist. Another type of map can help organize information or show the connection of people and ideas who all share the same goals, but who may not yet be connected to each other. 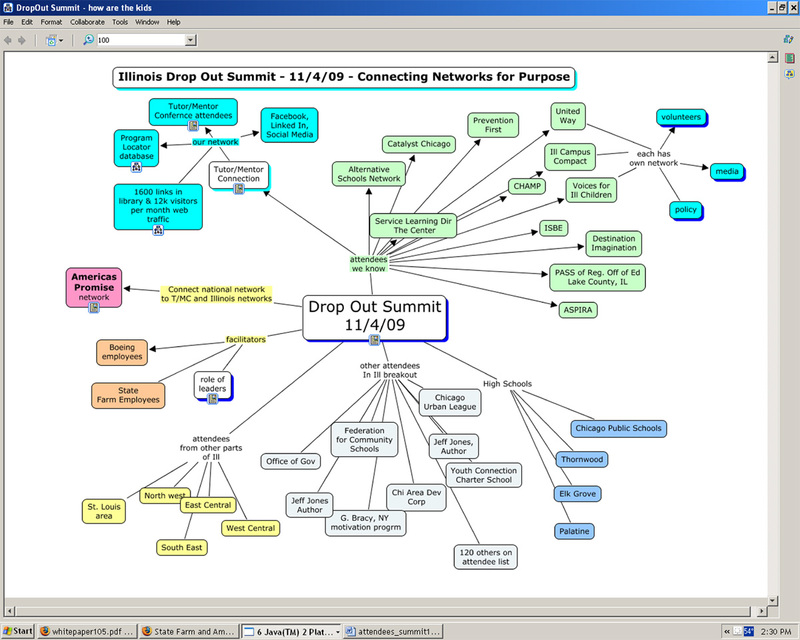 This concept map shows high school drop out prevention resources, ideas and people that I've connected with over the past decade. 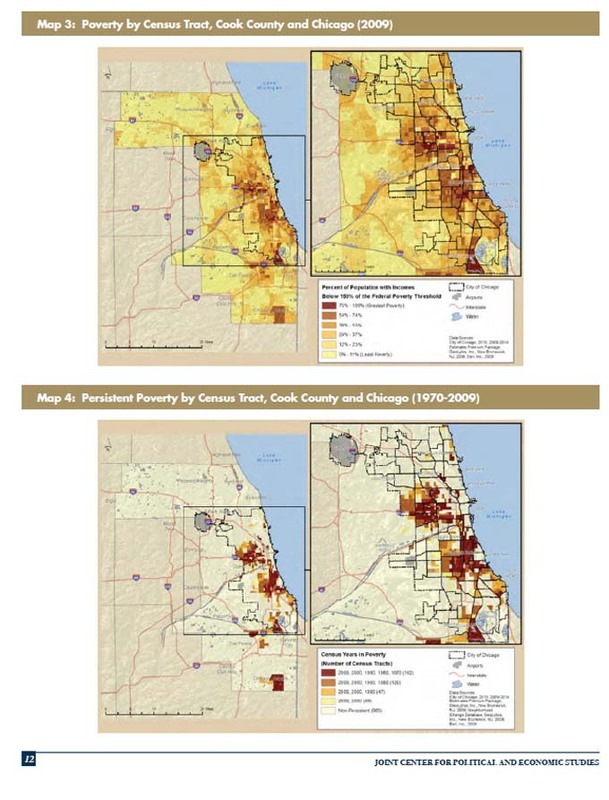 While I've been creating these maps I keep looking for teams in high schools, colleges, businesses and/or faith groups who will share this work with me, not only mapping resources to help Chicago, but mapping resources to help kids in any part of the world! Introduce yourself on Twitter or Facebook. Let's connect! Visit this link to learn more about advertising opportunities on this blog and four other blogs and web sites hosted by Tutor/Mentor Institute, LLC. Meet Charles Brooks, a long-term friend of the Tutor/Mentor Connection and Tutor/Mentor Institute, LLC and read about his wellness journey to good health. Join Wellness Talks on Blog Talk Radio. http://www.blogtalkradio.com/trivitawellness . Join Friends of Nopalea on Facebook. Note: we are testing this concept. Advertisers will be added as they apply. In this video Manuel Lima, senior UX design lead at Microsoft Bing, explores the power of network visualization to help navigate our complex modern world. As you watch this I encourage you to look at the concept maps I've created to map knowledge and networks. 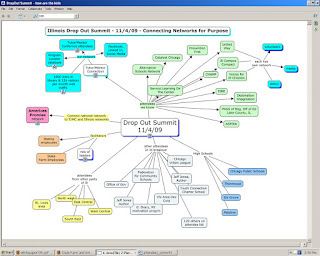 If we can create a visualization that works like a "blueprint" to show steps needed to help kids from birth to work, and the network of supports needed at each age level, our networking with people throughout the world can fill each node in our map/library with people, organizations and ideas related to that specific node. Thus we can provide more ideas for each group of people working on this same long-term goal of helping kids in more places get the support they need to move from a birth in poverty to a life out of poverty. How can we connect with people at Microsoft, Google or other information innovation organizations who will add us to their team and/or provide us with the talent, dollars and technology to build out this project? This week I'm part of JELLY WEEK 2012, where I'm connecting with people from all over the world who are thinking about similar ideas.